The secondary baffle on my MCT is (or was) too long. It was cutting into the primary's light cone and caused a reduced effective aperture. I removed the secondary baffle for some testng and I am ready to cut the baffle to some length and reinstall it. I am not sure it has the proper shape, but I want to work with what I have along with the untouched primary baffle, both as is. It's just the easiest approach even if optimization suffers a little. As mentioned, the secondary baffle is too long and causes vignetting of the marginal rays. I want to trim it's length to open up full aperture while keeping it's diameter as small as possible (shooting for ~47mm, 31% co.) However, I'd also like to balance that with the most stray light protection I can get within about 19' arc in terms of vignetting. Normally, I am using medium to high power on planetary, lunar, and double stars so can probably get away with a bit lessor fully illuminated field. I'd like your help double checking my math, logic, and whatever reasons I may have left out. Edit: Using a 25mm Plossl, I notice vignetting about half way toward the edge of it's 0.65 degree TFOV. Same happens with star images, they begin to flatten about halfway out from the center 0.65 degree FOV. So, I /suspect/ the unvignetted 19' arc FOV is present, already, while 'additional' vignetting occurs off axis at the primary baffle. With the baffle installed, I ran a laser along the edge of the meniscus, striking the edge of the primary, and found the laser spot hit the outside of the secondary baffle about 17mm down from the opening. Centering the full moon in the FOV, the outside of the baffle was illuminated down to about half it's length (41mm side.) So, about 20mm (half it's length) seems a good starting point. At that length, I calculate the opening to be about 48mm in diameter (32% CO.) So, I am close. The reason I want to get down to 31% co has to do with my estimated Strehl ~0.94 and optimizing for contrast. There seems to be a sweet spot at 31% co. I could stay at 32% co and be done with it. But I do want to squeeze every ounce of performance. So, I have to trim the length back a few more milimeters to about 25 or 26mm (a bit more than half length measured from the opening) to achieve 47mm diameter. I calculated this using trapezoid math. 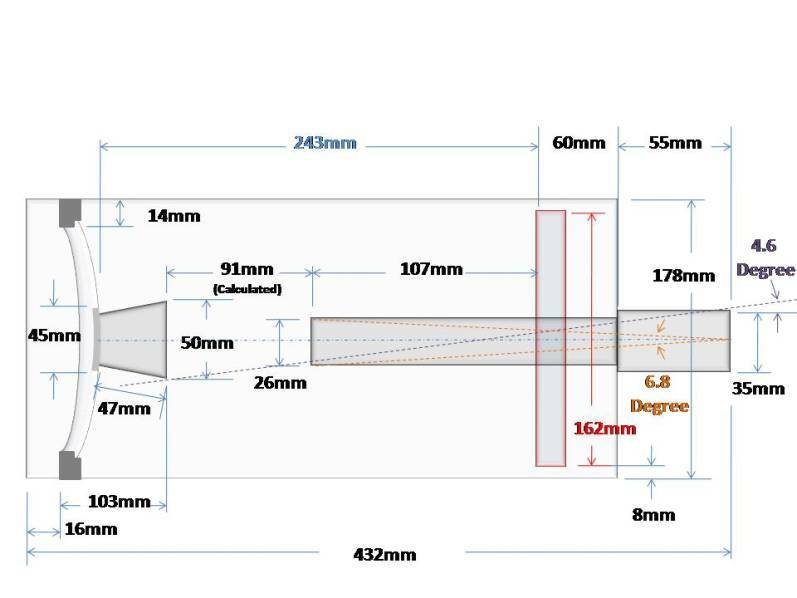 This seems to suggest a baffle length of about 15 or 16mm (41mm length - 26mm cut.) Question is, is this sufficient length to provide some stray light protection or is it too short and meaningless. By the way, at reduced effective aperture and the original 53mm baffle opening, the scope had an effective 38% co. Removing the baffle brought that down to 31% - at full aperture - leaving only the silvered 'spot' diameter. Truthfully, during testing, I cannot say whether there is any stray light problem without the baffle. With some security lights around the neighborhood, I just could not notice any stray light. The sky background might offer a little problem. I'd feel more comfortable 'squeezing' as much stray light protection as I can get while opening up full aperture (first and foremost) and reducing the co diameter. Any discussion and help is greatly appreciated. Dry season is a month or so away and I want to get it done. Thank you. The latter is part of my project, but not necessary for the topic at the moment. Attached is an image looking past the secondary and down the primary baffle. I plan to nullify that bright reflection from the visual back interior, it's a threaded part. Of course, the brightness is highly exaggerated being illuminated by a LED flashlight at the diagonal. But, it's still a potential problem. Ideally, BOTH baffle tubes are conical for optimal shielding without unduly cutting off too much light. Usually the size and shape of these can only be calculated by interation, that is you design the optics, add the baffles and perform ray tracing to see how it works. If you find marginal rays are being cut off or you have sky flooding, you redo the baffles. Thank you, John. I am kind of doing that. The optics are set, the primary baffle is set, though, I don't want to rip it apart and mess with it. So, the only variable (and problem, really) is the secondary baffle length. The secondary is conical, the primary is pretty much straight. I keep calculating a length of about 15 to 17mm. Before removing the secondary baffle, did you perform the flashlight test and observe what if any illumination there was on the *interior* wall of the outer part of said baffle? I suspect that for on-axis illumination there should not be any. A supporting bit if evidence for this supposition comes from your picture above, which shows that even in the absence of the baffle one seemingly cannot directly see any part of the eyepiece field. You note a 'useable' 32mm on the scondary mirror, as opposed to its 45-46mm diameter. This, in conjunction with your photo, leads me to conclude that the secondary spot is oversized. This is further suppirted by your observed lack of direct sky light flooding the field. It might well turn out that a secondary baffle is entirely superfluous. Do confirm the direct flooding issue. Set focus to infinity for your typical configuration. Remove the eyepiece and peer up into the system from as far off-axis as you can. If no direct view of the scene beyond can be had in a crescent defined by the primary baffle inner opening and the edge of the aluminized spot, remove the diagonal and see if it's now possible to do so. Let us know what you find. I myself much prefer to empirically test the working article than rely solely on the math. Glenn, that's really the approach I'm taking using math to kind of support my findings. I did perform the flashlight/laser test more than a few times, but did not observe any 'green' light on the baffle interior. I didn't think to do so, only measured the output beam. However, ray tracing a laser from the meniscus end it was apparent marginal rays struck the outside of the baffle about 17mm from the baffle aperture. Lunar illumination (extended source) went to about 20 to 25mm down the outside of the baffle. This seemed to confirm the secondary baffle was the aperture stop. The secondary does seem oversized. I left the foam base of the baffle in place to reattach the baffle later if I screwed up. Plus it's a mess to remove but does not seem to affect the star test. The foam ring radius is about 1.5mm smaller than the spot's radius. It's interesting that it's easy to observe a low power eyepiece eye lens looking down the primary baffle without the diagonal installed. However, with the diagonal, I can see the reflection of the eyepiece barrel and part of the diagonal housing (reflective) but not the eye lens nor any image projected from it. 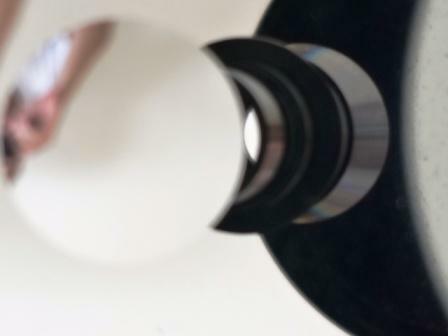 I believe this means, looking down the meniscus and into the primary baffle, you can also 'see' a small part of the diagonal mirror at less angle than shown in the image. In fact, on further inspection, I found a potential source of reflection in the diagonal housing above the mirror and below the eyepiece barrel. That section of the diagonal housing produces a bright ring when sunlight (from a window) is allowed to enter the eyepiece. I flocked that section to confirm it's location. Attached is an before and after image of the exit pupil. 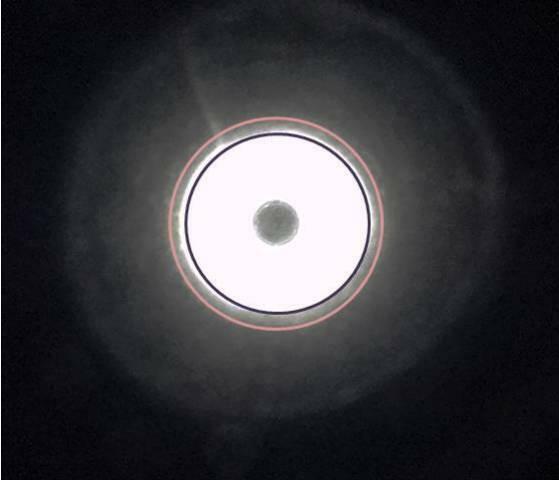 Looking up the visual back without the diagonal, a crescent of meniscus can be seen off axis (looking along the edge of the primary baffle), but not on axis nor slightly off axis. So, some stray light is striking the structures near the open visual back and probably into the diagonal and it's mirror (at small range of grazing angles.) With the diagonal in place I can see a thin sliver of the meniscus itself, but as before not on axis. To illustrate the mathematical difficulty, I measured the working focal length of the 162mm primary alone to be about 316mm. But the meniscus increases the focal length by an unknown amount (~0.1) depending on it's power. To use the full 162mm of the oversized primary, I calculate the power to be 150mm/162mm ~ 9%. That's a bit too much for a MCT meniscus, closer to 4% to 6% is more like it. So, it's possible the entire primary is not in use. Measuring the primary alone shows it to be 316mm/162mm ~ f/2. Fudging a bit, due to empirical observation, the primary/meniscus combo seems to give an effective f/2.2 (316mm * 1.14 due to the meniscus power) From the steepness of that light cone at the secondary spacing, I calculated about 32mm of useable secondary and that seemed consistent with the diameter of light cone (~57mm diameter) at the baffle opening (53mm diameter) at about 41mm 'above' the secondary. From the upper baffle opening, both the light cone and the conical baffle collapse in diameter toward the secondary to 32mm and 39mm (inside diameter), respectively. There is a ratio here (slopes of the sides), but I don't know how to calculate how far down both will intersect. So, I measured it using a laser and lunar illumination. Those two cones appear to intersect /about/ half way down the baffle's length. Below are with (left) and without (right) diagonal views up the visual back through the primary baffle toward the meniscus. I tried to scale them so that half of the secondary is visible. Thank you, Glenn...for taking the time. How does a ring of glare outside the exit pupil affect the image contrast IN the exit pupil? It also seems the relative diameter of those glare 'rings' seem to indicate their position within the scope's mechanics. The larger the ring, the closer the offending structure is to the eyepiece. Trying the exit pupil test you mentioned awhile back, below is a before and after flocking the upper diagonal area. The exposures are not the same, but the brightness of the outer ring is apparent before (left) and noticeably reduced after (right) flocking. I think I know the source of the inner ring. But the central glare? Dunno what that is...scatter in the lens? Overexposure? Both are reflections and not direct light. I think flocking those reflections will make the secondary baffle less important. But, adding 16mm of baffle might force direct light to enter at slightly larger angles and help even more. If I did the math correctly, it seems adding another mm of CO diameter and pushing that diameter out to a baffle length of 16mm will offer .75 degree of additional stray light protection. Clearly, the farther back the eyepiece, the farther removed from the field stop is the direct sky light. Do you sometimes use the scope straight-through? (Your sketch immediately above suggests this configuration.) If so, every bit of extra baffling you can provide will help. And when using a diagonal as well, but less critically so. Yes, the larger the 'rings' surrounding the exit pupil, the nearer to the field stop their source. In your latest image pair, there are three sources of glare: the illuminated primary baffle wall *immediately* surrounding the pupil; a ring about 1 pupil diameter removed from the pupil's edge, which seems to be in the front part of the diagonal; and a distant outer ring which might be the eyepiece's front threaded part. Any glare source outside the eye's own pupil will not impact the view. And so the important surfaces to baffle for are the inner wall of the primary baffle down to certainly the front part of the diagonal. My feeling is that the best compromise might be obtained by cutting off just enough of the baffle to result in a paraxial ray just clearing the inner lip. By the way, when using a laser to 'ray trace' the system, I trust you're placing a sheet of flat glass (as from a picture frame) against the from cell, to serve as an autocollimator. That is, the laser is sending paraxial rays through the system when its reflection from the flat plate is directed back upon itself. Glenn, I have observed straight through, but doing so is awkward. Mainly I employ the diagonal to observe planets near the zenith at this latitude (15N.) So, the sketch above is just to check the status at the visual back realizing the diagonal adds a tiny bit of distance and stray light angular separation from the field stop. 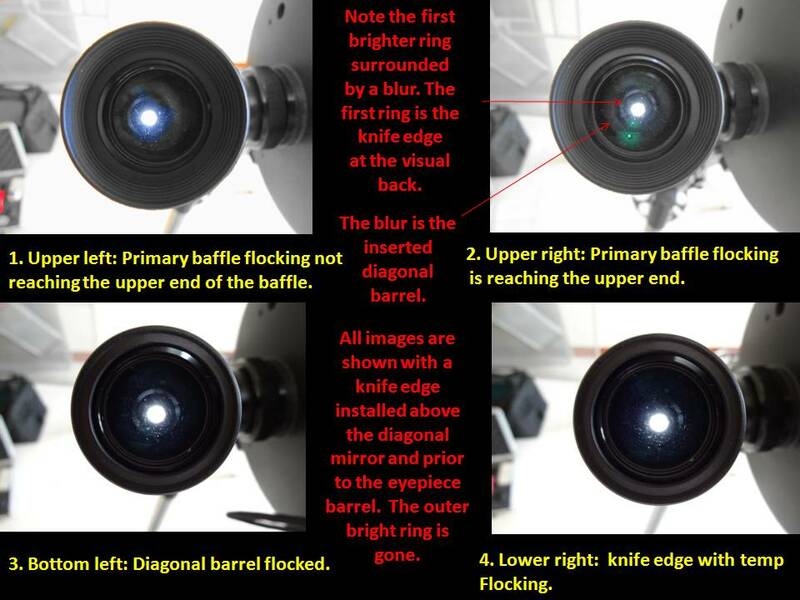 I suspect you're correct about the three sources if illumination: primary baffle, visual back/diagonal, and eyepiece barrel (rather the diagonal wall just below the end of the eyepiece barrel.) Flocking the latter seems to cut out that largest ring. I have noticed only one problem with glare as Jupiter is outside the FOV observing the Galilean moons. A bright streak briefly forms across the FOV. I suspect this is caused by the widest source of glare near the upper end of the diagonal. The flocking paper I am using is not the best, it's local and immediately available felt paper rather than the good stuff. It might need to be replaced. I did not flock all the way to the top of the primary baffle leaving a small section of raw primary baffle at the opening to prevent vignetting. That bit of glare could probably be improved. Yes, the primary baffle, while being very light tight (impossible to see any meniscus directly), was too long and has a shallower slope than the primary light cone. Removing the baffle raised concerns of possibly allowing a turned edge into the image. Star and Ronchi testing seem to show this was not the case, fortunately. However, the effect on the star test was startling. Outside of focus lost some definition and appears soft. However, upon closer inspection, the outside focus diffraction ring brightness and structure seems to remain well corrected and the views do not seem to suffer. In fact, the views improved somewhat by reducing the CO diameter while opening up full aperture - a condition I prefer. Yes, cutting off just enough baffle to allow the marginal rays to pass is a good option I am considering. Part of the reason I am still testing is to evaluate whether making it a tad shorter and smaller in diameter would still provide sufficient stray light protection at the diagonal. Additional flocking might optimize the system. This is the first time I've really inspected the exit pupil, per your suggestion in another thread. It's interesting and telling. Glenn, thank you for hanging in there with me on the project. Now that you've mentioned it, below seems to be the sources of illumination. The secondary is well lit pointed out the window. But the light cone seems to fit comfortably within the primary baffle. Star vignetting occurs (noticeably) about 20 arc min from center FOV. This vignetting is caused by the primary baffle as it remains unchanged with the secondary removed. So, the source of the illumination is probably due to the annulus of the meniscus, even though it is not seen directly on axis? This seems to suggest, ideally, the secondary baffle should "shade" the upper end of the primary baffle. And it might suggest good flocking might eliminate all of those reflections, as evidenced by the outer ring disappearing with flocking in place. The single knife edge at the visual back has a flat, reflective (black) surface along the circumference of it's opening. The very presence of a brighter annulus of illuminated inner primary baffle wall at the inner end, as seen through the exit pupil, tells us that you can extend the flocking much nearer to the end. As seen through the exit pupil from on-axis, the extension should terminate just at the point of appearing to reach the baffle end. This will still leave a short length of exposed baffle wall, of course, but the minimum of scattered light rom this source will obtain, with little to no real impact on vignetting. A shorter secondary baffle, as you envisage, will not *by itself* very significantly reduce direct sky light illuminating the *upper* end of the primary baffle, at least when no dew cap/shade is employed. As 'seen' from the upper primary baffle opening, the additional solid angle of sky blocked by the annulus the baffle projects is not so very greater than that of the aluminized spot itself. That is, the angular area of sky passed through the meniscus is not much reduced. Naturally, for ever deeper parts of the primary baffle, the extra blockage afforded by a secondary baffle becomes more efficacious. And of course, with a lens shade installed, the relative increase in sky blockage via the secondary baffle increases, due to the blockage through the outer portion of the meniscus. This helps for all parts of the inner primary baffle wall. But as you undoubtedly know, the use of a shade is always advisable. So. Your decision involves the balance of competing factors. Maximal baffling with minimal aperture reduction/central obstruction increase. The better you can deaden reflections off bits near the back end and not too far outside the FOV, the less necessary the additional blocking provided by a secondary baffle. This component's primary function is to block the passage of direct sky light to the outer portion of the widest field stop envisaged. Can you confirm, as I'm still not fully clear on this; does the aluminized spot by itself block any direct sky light from reaching any portion of the outer field with the largest field stop you use? Glenn, thank you, again. I am gonna tinker some more and extend the flocking toward the upper end of the primary baffle. You're reading my mind. A dew shield does seem beneficial, here, but I'd rather not be stuck using one. Best I can tell, yes, the aluminized spot blocks direct lighting from the meniscus, comfortably so with the diagonal. When flocked, the entire baffle and visual back are dark when looking down the meniscus down into the primary baffle - with eyepiece illumination from the sunlit window. 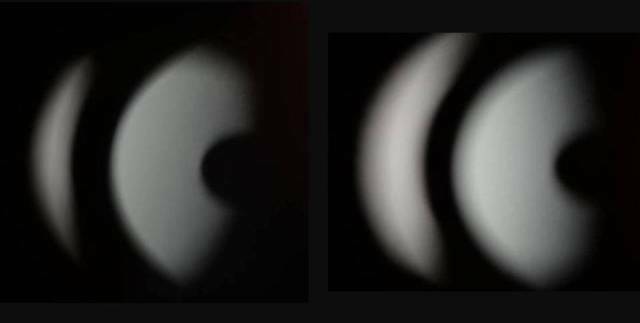 Without flocking, only that bright outer ring's source can be seen as a bright arc (beyond the diagonal mirror and just short of the eyepiece barrel.) No sign of the field lens nor light projected /directly/ from it using the diagonal. That's good news. Looking down the primary baffle again, without the diagonal, I can see a very thin sliver of the field lens of a low power (25mm) eyepiece inserted directly into the visual back. A slight increase in baffle diameter and length might just cover that sliver. I have to look at a very tight grazing angle to see it. I wish I could do the math to work out exactly what diameter and length would be required to cover the given amount of field lens being visible. I just don't have those figures, will probably have to wag it. The majority of the glare seems to be reflective in nature, totally so with the diagonal, and so it might be effectively dampened by efficient flocking. Yes, I am looking to strike that balance, and think I can since I usually use mid to hi power and smaller fields. It would be nice to protect that 25mm, though. Here's a view without the diagonal but with a 25mm eyepiece inserted and back lit by a wall. Another thing you can do while examining the exit pupil and surroundings (if I neglected to point it out before); change your view angle over the full range, out to the apparent field semi-angle. Don't always restrict to the on-axis view angle only. This effectively changes your viewpoint over the full diameter of the field stop, not just from the center of the field stop. Edit: I did so but don't see much else, just a different aspect of the same reflections. The sequence is simply flocking progressively toward the visual back with the secondary baffle still removed at this point. Flocking the knife edge (lower right) was a quick fix, it's letting some light slip through. I can fix that. But, over all, flocking the diagonal seemed to help greatly. When I was observing before, the primary baffle and diagonal barrel flocking was in place. Whats new is the knife edge above the diagonal mirror and some flocking of the knife edge. It has a flat inner circumference that reflects some light. I agree, Glenn, adding the shortened baffle will do little for the glare at the primary baffle upper end. Maybe some good quality flocking paper will help and get me to that compromise point. If I reinstall the baffle at all. The baffle, visual back, and the diagonal are looking pretty good. Using the scope without the diagonal, however, might pose some reason to reinstall the (cut) baffle for the sake of completeness. That upper primary baffle end remains my concern at this point because that glare lies closest to the exit pupil. That and a good cleaning. However, as shown in the image above, it takes quite an angle (much larger than the moon) for a ray to sneak past the secondary and strike the upper end of the primary baffle. Any light emanating from that upper baffle portion might be more scattered and diffuse than reflected and intense. So, with internal reflections minimized and the threat pretty much gone, the problem remains what length is sufficient to cover direct light into a low power eyepiece inserted directly into the visual back? One more point to clarify before winding down this thread. I think I'm getting to the point of understanding, thanks to your help, and might just go with what I know instead of endlessly pursuing perfection. On flocking the primary baffle interior and reducing it's inner diameter, will that reduce effective aperture or simply reduce the fully illuminated FOV? I suspect it depends. Most ray tracing seems to show the secondary light cone just grazing the primary baffle's outer opening. But this light cone bundles all rays on and off axis and it will have a given (fully illuminated) diameter entering the primary baffle. It also includes vignetted objects outside the fully illuminated FOV, but the fully illuminated field should fit exactly the primary baffle's aperture. The reason I ask is because my primary baffle flocking does not fit snugly against the baffle wall. One of the upper corners droops ever so slightly and intersects the light cone. I can see this during star testing out of focus. Part of the out of focus image is 'notched.' And that's at the center FOV out of focus. Though I don't know if the entire drooping corner is seen, or simply the very tip. That suggests to me a very small fully illuminated FOV, as expected, but maybe smaller than expected. It might suggest possibly some vignetting across the entire field, including the center, if the image (light cone) at center is just barely fitting into the baffle opening. But, I cannot visualize that. Such a condition, as observed during out of focus star testing, seems to suggest another potential aperture stop at the primary baffle opening (since one corner of the flocking paper cuts the light cone.) But, I am not sure that's actually the case. I do not notice any "squashing of the out of focus image until it get's closer to 20' arc from center. I'm confused. But, will adding flocking paper thickness to the primary baffle interior simply affect the illuminated FOV a tiny bit or does it vignette the on axis image as well? Is that normal, much like sticking your finger into the light path and seeing the shadow? I suspect that's why some folks warn of flocking to the upper baffle opening. In any case, I think flocking the offending mechanical parts and slapping the reduced baffle on will be about as good as I can get reusing stock parts. Reducing the CO diameter has already offered some improvement, effective flocking should top that off. Question is, can I risk flocking all the way up the primary baffle? Thinking out loud, it is possible opening up full 150mm aperture and allowing a broader light cone to strike 33mm of the secondary (instead of vignetting it) might make the light cone too large for the otherwise optimized primary baffle. Whereas previously, the secondary baffle trimmed some of that light cone giving more tolerance for the primary baffle's opening and a wider (140mm eff aperture) fully illuminated FOV. Turns out, doing the math, if 33mm of secondary is used at full 150mm aperture, the light cone will be 22mm at the baffle opening 142mm away (using back focus to include the diagonal.) The primary baffle opening is 26mm (OD) and will allow some off axis images without vignetting. Allowing for the baffle wall thickness, I estimate the ID to be closer to 23 or 24mm leaving about half to one millimeter to spare on each side. The angle of 0.5mm over a distance of 142mm is 12' arc. However, 0.5mm does not leave much room for flocking at the baffle end and such a small clearance can explain seeing the drooped corner (just the very tip) of flocking paper intruding into the defocused star image. Whereas vignetting (140mm eff aperture) occurred at 20' arc before, the fully illuminated (150mm aperture) FOV is probably smaller now. So, opening up full aperture makes the baffle pretty tight, but there is room for a tad more than slightly on axis on the order of 12' arc. Narrow, but just fine for planetary and high powered lunar observing. If the full 39mm of available secondary surface is used, the light cone will be the same diameter (26mm) as the primary baffle. I don't think that is the case given the meniscus/mirror spacing and the primary's focal length. Something is amiss with the math, need a clear night to test it. But such a calculation seems consistent with not observing any vignetting at 320x during collimation (out of focus) across a 11' arc TFOV. I'm really impressed Norme. To begin with I never considered the diagonal as a reflection point . Not because I couldn't believe it were possible but just because it never occurred to me. You really bribe some ground here in the flocking realm. I'm now considering flocking my diagonals but Im not sure if I can do it to the upper ocular tube section if only because the eyepiece needs to slide in that tube and flocking would prevent that (?) . What an interesting thing though. How many folks very carefully flick their scopes but neglect the diagonal. I've got to look into this for both my sct and refractor and come to think of it , reflector. Very impressive Norne! Thanks, Pete. It's enjoyable, keeps me occupied during rainy season and being retired. Hey, perform the exit pupil test Glenn talks about before you flock anything. It's quite instructive. I found a digital camera helps, you can process the image and see the glare pretty well. The results, if you have glare, are impressive. But, yea, now my entire mechanical path is black. It just remains to make that move to cut and reattach the baffle...after some more star and lunar testing. The math suggests I am close to some primary baffle vignetting, but observation seems to differ. I wanna check it out. But, the flocking part is pretty much done. You're getting close, Norme. The improvements in scatter surrounding the exit pupil is impressive! 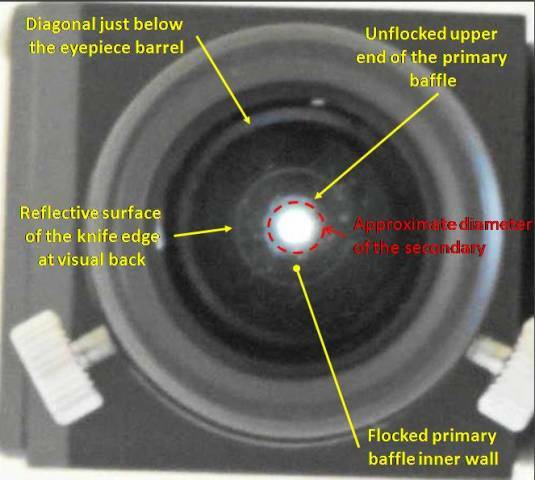 To verify light cone clearance at the primary baffle opening, examine the exit pupil with a 10X magnifier, or inverted eyepiece serving as such. You should see a small (perhaps exceedingly small) annulus of space between the baffle opening's edge and the reflection of the primary off the secondary. This might be easier to see when the scope is aimed at a wall rather than the bright sky. And a strip of something stretched across the front of the OTA might give your eye a useful reference. If no such annulus is discernible, view the exit pupil from an angle. This locates your viewing angle off axis, some distance away from the field center. You should now see that the primary baffle opening and the reflection in the secondary mirror are a little offset with respect to each other. Does a 'gap' now appear where a crescent of 'space' is seen beyond the edge of the reflection of the primary mirror off the secondary? With a long f/ratio visual instrument like this, as long as the on-axis light cone just clears the primary baffle opening, you're doing well. Especially if the flocking can be extended right to the baffle's lip. If vignetting commences immediately away from the field center, that's OK, for the fall-off will be suitably gradual. Also, the flashlight text is your friend, too. 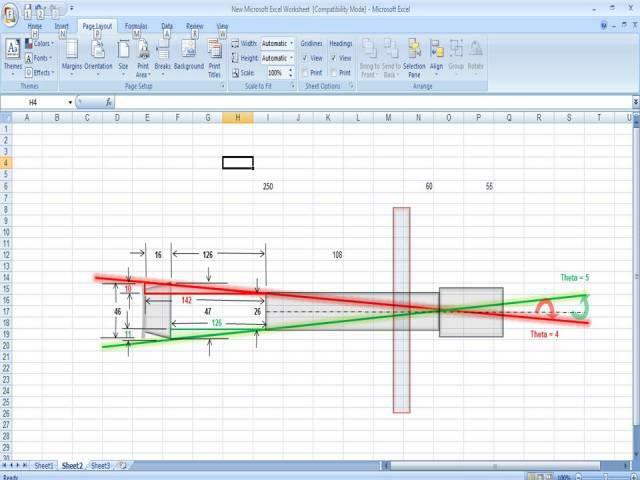 If the flocking is the cause of on-axis aperture reduction, it will be evidenced in the reduced collimated beam emerging out the front end. And if your light source is suitably small (a green laser in conjunction with a beam expander will provide a diffraction limited source), the sharpness of the shadow might actually resolve the flocking texture. Glenn, yea, I confused myself trying to plot and do the math. You're reading my mind about actually "looking" at the FOV. Thank you for the suggestion, it is similar to my own thoughts on how to do it without a clear night to actually measure the FOV. Even using a defocused star, it seems difficult to detect the exact edge of the fully illuminated FOV. I'll give your test a go. Yes, the flashlight test occurred to me, as well. It seems correct to predict the ratio of the flocking thickness to the cone diameter will be the same as the vignetting relative to the full aperture. 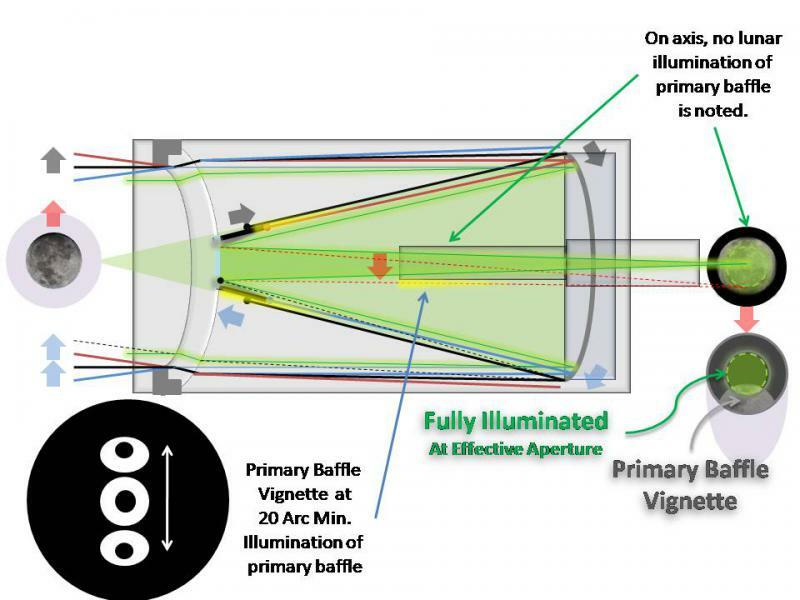 So, with the light cone ~22mm at the baffle entrance, a 0.5mm vignet would be the same ratio as 150mm clear aperture and about 3mm reduction of aperture radius...if it vignettes at all. In any case, I'm not going to modify the primary baffle so I have to accept what it gives me if I want full aperture and an improved effective CO diameter. With 140mm effective aperture reduced by the secondary, the CO was 38%. At full 150mm aperture and only the silvered spot, it's a more palatable 31%. The improvement is most notable in stellar diffraction and somewhat reduced lunar diffraction effects. On planetary, it's not so easy to tell. One other thought on the glare at the upper end of the primary baffle, that glare not only extends over the darker portion of the baffle interior but it also extends over the opening and into the light cone from the secondary. Since it can be seen, some rays are making their way toward and onto the focal plane. That's a source of contrast loss than can reach the focal plane on axis or nearly so. Edit: Below is a view straight up the visual back (no diagonal.) There does seem to be clearance. You can see the flocking paper intrusion mentioned. If the entire 39mm of the secondary is in use, there is likely some vignetting at this back focus (at infinity.) However, if a smaller section of the secondary is actually in use, then I have a few millimeters to work with. I need to star test and look for vignetting. Thus far, during collimation with a 6mm TMB II at 320x and 11' arc TFOV, I have not noticed any change in the star's defocused pattern across the FOV. I suspect there is no vignetting, though, not at this FOV, as the entire secondary is not in use based on mirror/lens spacing and the primary's focal ratio. 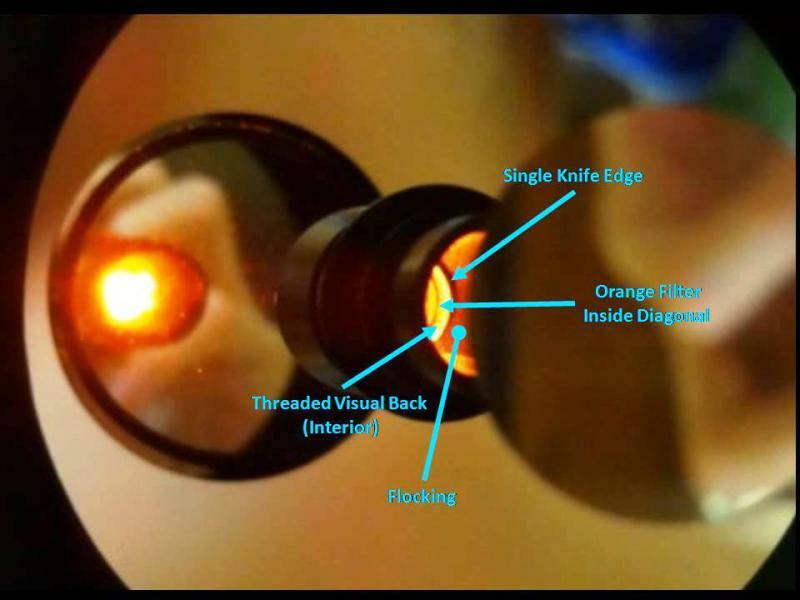 More on the low power eyepiece exit pupil examination (magnified) later. That's a difficult test to align and get a good reading, even from a more dimly lit wall. If I scale the image and /approximate/ the position of the baffle's foam attachment ring (39mm diameter), then the primary baffle opening scales to 36mm and the dark ring is 33mm. It's really looking like the secondary baffle is not required to any *pressing* degree. Was this taken with the camera placed very close to the rear port? If so, how much does this annulus (indicating clearance of the light cone) shrink when the camera lens's iris is located farther back at the scope's focal surface? Yes, I'm sorry for not being clear. The last image above was taken at the diagonal. It's the same image as the one in the post before it (at right) showing on and off axis views at the diagonal. The next one above, showing the flocking paper circled, was taken at the visual back. That dark "edge" is not the primary's edge, it is the baffle's foam base that remains on the secondary. But, it just clicked...I need to locate the primary's edge. Thanks for the reminder. That might be difficult, because the entire secondary is lit up and the mirror's edge is not obviously seen. Curious. Maybe that means the oversized primary is throwing a lot of off axis rays onto the secondary completely filling it's 39mm aperture. Question is, which of those rays remain unvignetted at the primary baffle opening? As to how much it changed? Well, the foam ring is apparent in the image from the visual back (no diagonal - top of this page), it's no longer visible with the diagonal. I tried to estimate it's location with the reddish circle in the next image taken at the diagonal. The darker circle is an estimate of the on axis cone. But, exactly how far offset the foam ring is, I just don't know. The "off axis" image gives some idea. Anyway, I did not remove the baffle's foam base when the baffle came off. I might try to peel it off, but doing so might cause some damage to the secondary coating. Or leave a sticky residue. I left it in place incase the baffle had to go back on as a result of star testing (turned edge, whatever) at full aperture. 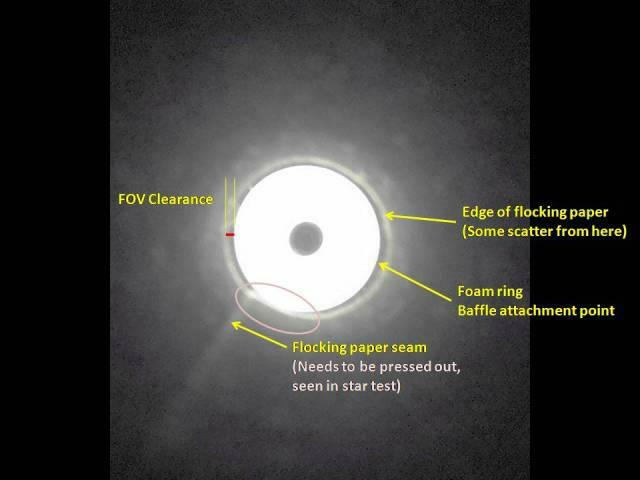 The foam ring does not appear in the star test. That is a clue that the useable light cone, fully illuminated, is at least smaller than the diameter of the foam ring. I imagine if star testing is done well off axis, it might show. But, so far there is no detriment to the star test, that I can see, from either the foam ring or opening up full aperture. A turned edge is not apparent, thankfully, but some residual undercorrection is, as expected. I'd agree, the secondary baffle might not be needed at all. In this case, this just turns into a study of stray light as is. That's fine. Found some reflections and cleaned them up. Lemme see if I can spot the primary's edge...I'm curious because I don't remember seeing it.